← The Most Impressive Live Global Twitter Map, Ever? One of the advantages of working at QCRI is that I’m regularly exposed to peer-reviewed papers presented at top computing conferences. This is how I came across an initiative called “Seriously Rapid Source Review” or SRSR. As many iRevolution readers know, I’m very interested in information forensics as applied to crisis situations. So SRSR certainly caught my attention. The third feature worth noting is the “Eyewitness” icon. 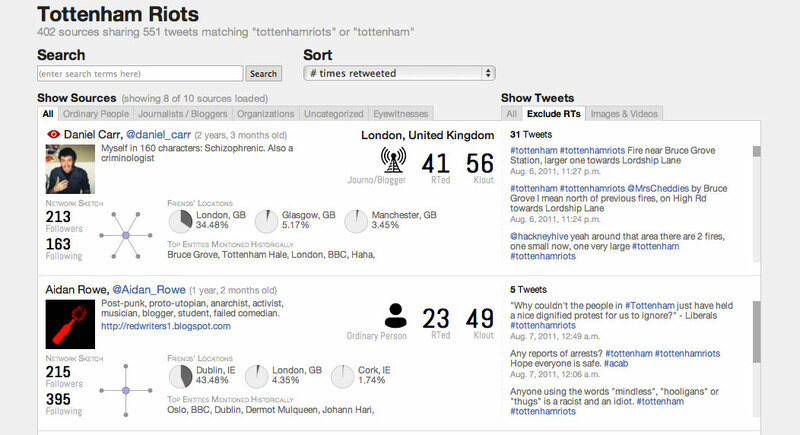 The SRSR team developed the first ever automatic classifier to identify eyewitness reports shared on Twitter. My team and I at QCRI are developing a second one that focuses specifically on automatically classifying eyewitness reports during sudden-onset natural disasters. The fourth feature is “Entities,” which displays the top five entities that the user has mentioned in their tweet history. These include references to organizations, people and places, which can reveal important patterns about the twitter user in question. In sum, SRSR could be used to accelerate the verification of social media con-tent, i.e., go beyond source verification alone. For more on SRSR, please see this computing paper (PDF), which was authored by Nicholas Diakopoulos, Munmun De Choudhury and Mor Naaman. This entry was posted in Big Data, Crowdsourcing, Information Forensics, Social Computing, Social Media and tagged Computational, Journalism, Source, SRSR, Twitter, verification. Bookmark the permalink.